Diana DeGette is a U.S. Representative for Colorado’s 1st District. DeGette is serving her 11th term and was first elected in 1996. She led efforts to permanently reauthorize the Land and Water Conservation Fund, and voted to protect sage grouse habitat. She has criticized President Trump’s effort to scale back national monuments and remove limits on methane pollution. 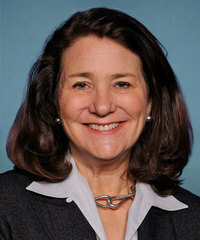 U.S. Congressional Representative Diana DeGette Led Efforts to Permanently Re-authorize the Land and Water Conservation Fund (LWCF). U.S. Congressional Representative Diana DeGette Supports Sage Grouse Habitat Protections. U.S. Congressional Representative Diana DeGette Criticized Trump’s Monument Reductions. U.S. Congressional Representative Diana DeGette Supports Limits on Methane Pollution.